The 'Accord' potato is a first early variety that produces high yields of uniform, oval tubers which look and taste sublime. ... 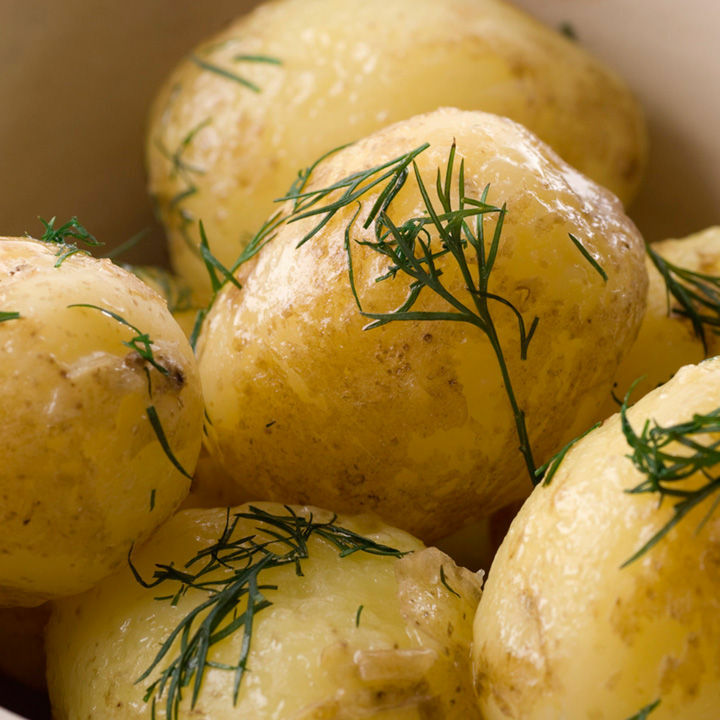 The high dry matter texture of the potatoes means that they are firmer and hold their shape which makes them great for chips and boiled potatoes. When your seed potatoes arrive unpack them and place them in trays (an egg box works well or you can use a wooden tray) in a light, cool, airy frost-free place to develop the sprouts prior to planting. 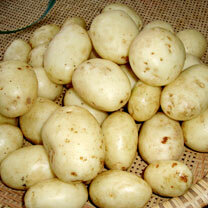 This will enable your seed potatoes to grow much faster once they are planted in the ground. The pre-sprouting is a process called chitting. Dig a trench about 10cm (4") deep using our Garden Ridger is the easiest way to do this. Place the seed potatoes in the bottom with the sprouts facing upwards. Fill the trench to cover the seed potatoes and a top dressing of Potato Fertiliser can be applied to boost growth. As the shoots emerge it is important to "earth up" (cover them with soil) to protect them from frost which will cause the shoots to blacken and delay cropping. 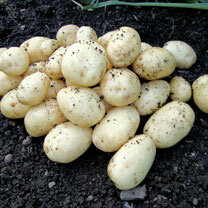 During prolonged periods of dry weather you will need to water regularly to enable the tubers to form. When the stems have grown to 25cm (10") above ground level they should be "earthed up" again to prevent the tubers near the surface turning green. When to lift will be dependent on the type of potatoes you have planted, please see the table below. Lift early potatoes when the flowers start to open and the tubers are the size of large eggs. Maincrop varieties potatoes should generally be left at least two weeks after the leaves and stems have withered, cut the stems just above soil level to prevent diseases such as blight getting into the crop. Lift the tubers gently from underneath with a Potato Fork or with our Potato Harvesting Scoop. The lifted potatoes should be left on the surface of the soil for a couple of hours to allow the skins to cure before being stored in paper or Hessian Sacks. Potatoes stored in plastic bags will sweat and begin to rot very quickly.